iCoolsoft iPad Transfer is the best iPad 2 tool to help you transfer video, audio and photo to iPad and backup all iPad files to computer. It even enables you to convert DVD, any video and audio file to iPad supported files, and load output files to iPad directly. Other devices like iPod, iTouch and iPhone are also supported.This iPad Transfer enables you to easily enjoy all sorts of videos and songs on iPad, and backup iPad files and folders to hard disc without loss. It is the ideal iPad manager tool to help you use iPad in an easier way. iCoolsoftiPad Transfer can import video, audio, photo files and folders from PC to iPad without iTunes. You can easily enjoy any multimedia file on your iPad. 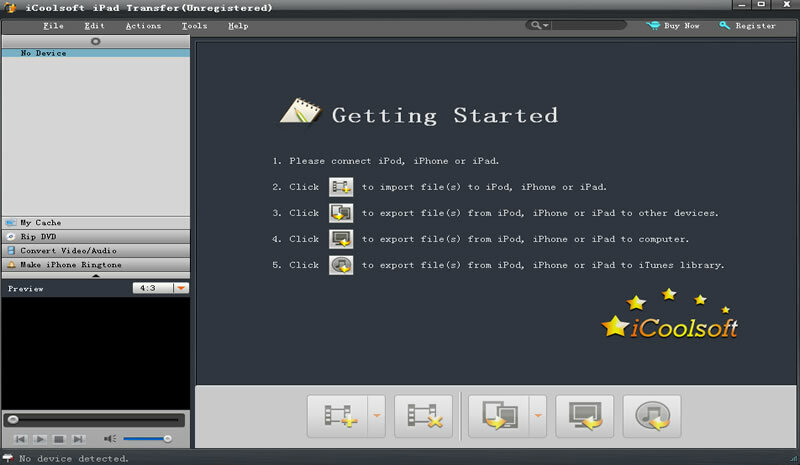 Besides the iPad supported video, audio format, other resources like DVD disc, any format of video, audio files are also supported by this powerful tool, which can convert all files to iPad supported format and import outputfiles to iPad directly. Handy search function can help you search files in the category of Name,Album, Artist, Genre, etc. This tool lists detailed information of your iPad like type, format, version, capacity, etc. It can achieve the fastest speed to transfer files between iPad and computer.